During the hearing in a jam packed courtroom, the bench hailed Justice Gogoi for his stern approach in dealing with complaints against apex court employees on the charges of wrong doings. ▶ Videos for "Justice Gogoi"
Ranjan Gogoi sworn in as the Chief Justice of India. Ranjan Gogoi appeared in action mode on the very first day of work. As Chief Justice of the Supreme Court, Justice Gogoi's tenure will be one year,.. Asserting his constitutional authority that "no appointment can be made in the SC unless the recommendation is made by the CJI", Justice Gogoi disapproved of names being considered for elevation and.. The judgement will be pronounced by Chief Justice Gogoi. The retired judge said the January 12 presser had an impact and things started changing for good during the remaining part of Justice Dipak Misra's tenure as CJI and is now continuing under the.. It is in "our best interest" to heed the advice of the Constitution, Chief Justice of India Ranjan Gogoi said on Monday and asserted that not doing so would result in "sharp descent into chaos". The.. In his one-year-one-month tenure as Chief Justice of India (CJI), Justice Ranjan Gogoi has plans to roll out judgments of the top court in Hindi and subsequently other regional languages, evolve a..
Justice Gogoi through video conferencing to judges talked about the 'no leave' policy during working days of court to take care of the large number of cases pending. The roster was last amended on February 1 this year and change was anticipated when Justice Gogoi took over, who previously claimed to be a victim of arbitrary allocation of cases. Chief Justice of India Ranjan Gogoi said Wednesday he and his colleagues were trying to evolve a system to produce better results and reduce pendency of cases, as he expressed hope that vacancies in.. 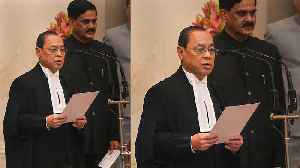 Barely hours after the new Chief Justice of India (CJI) Justice Ranjan Gogoi assumed office on Wednesday after being sworn in by President Ram Nath Kovind, it became apparent that change was..
Justice Gogoi succeeded Justice Dipak Misra. He will have a tenure of a little over 13 months and would retire on November 17, 2019. Justice Gogoi is known for his strictness and penchant to go by the rule-book and he himself made it clear while speaking at a function organised in his honour by the Supreme Court Bar Association..
No urgent mentioning of cases will be allowed till certain parameters are fixed for it, said Justice Gogoi, who took oath as the 46th CJI. President Ram Nath Kovind administered the oath to Justice Gogoi, 63, in the morning. Justice Gogoi will have a tenure of little over 13 months and will retire on November 17, 2019. Having declared democracy in danger at a famous press conference in January, Justice Gogoi's stint as head of the apex court will be keenly watched for what he does to defend this ideal, notes M J..
A month after President Ram Nath Kovind appointed Justice Ranjan Gogoi as the 46th CJI, he is all set to take the charge the country's top court. . In January, four judges of the SC, including Justice..
A month after President Ram Nath Kovind appointed Justice Ranjan Gogoi as the 46th CJI, he is all set to take the charge the country's top court. He will be the first CJI from the North East. In..
Justice Ranjan Gogoi to take oath as CJI; can he further strengthen the judiciary? Justice Gogoi will be the 46th CJI and have a term of 13 months 15 days. Justice Gogoi was all praise for the judicial wisdom of his predecessor in pronouncing landmark verdicts. Justice Gogoi lamented that the very issues which give a different identity to a community make its people hate those who are different. The CJI designate's statement comes while he speaking at the farewell of CJI Dipak Mishra. Chief Justice of India Dipak Misra held court, along with his successor Ranjan Gogoi, for the last time Monday, stopping a lawyer who broke into song to wish him a long life to say he was "responding..
Justice Ranjan Gogoi who is set to be the Chief Justice of India (CJI) next week have expressed deep concerns about the massive backlog of cases. Speaking at a session on “Role of Bar and Bench in.. The Supreme Court on Wednesday dismissed a petition challenging the appointment of Justice Ranjan Gogoi as the next Chief Justice of India. The petition was filed by advocate RP Luthra seeking to quash..
On October 3, Justice Gogoi will take oath as the 46th CJI. He will be the captain of judiciary till November 17, 2019. As CJI, Justice Gogoi will realise that there are far more significant debts to..
Justice Gogoi will be the first to become CJI from the Northeast. He was born on November 18, 1954 in Assam and hails from Dibrugarh.